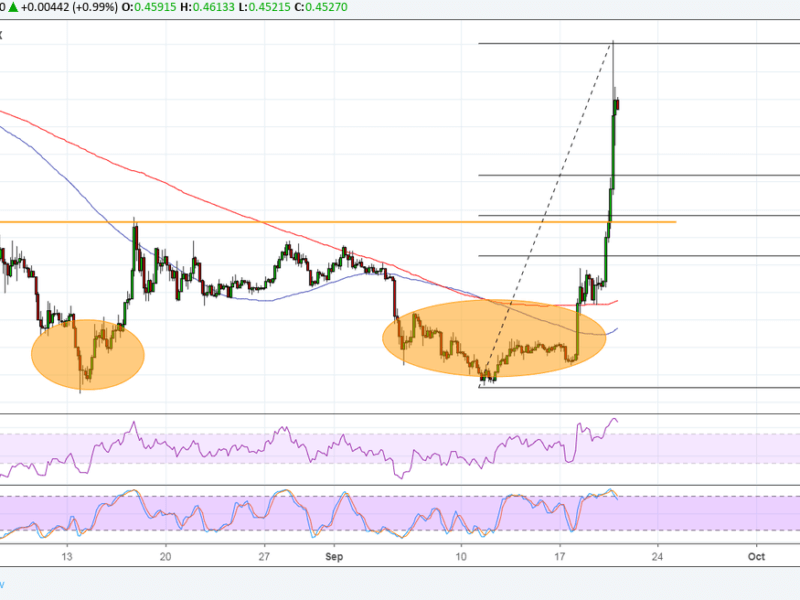 Ripple Price Analysis: XRP/USD Shoots Further North on PNC Welcome, Pullback Possible? 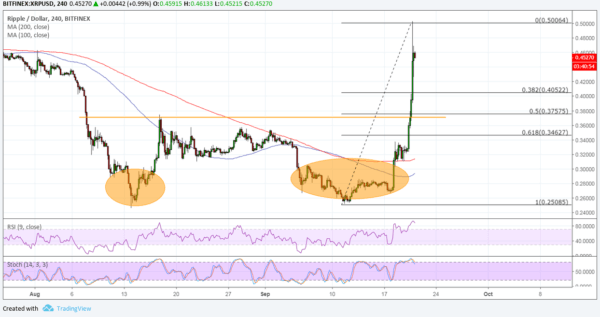 Ripple just recently busted through its double bottom neckline to confirm that an uptrend is underway. Price is stalling at the .5000 major psychological mark, though, and some profit-taking action could lead to a pullback opportunity that more bulls are waiting for. Applying the Fibonacci retracement tool on the latest swing low and high shows that the 50% level lines up with the reversal formation’s neckline. This .3800 handle might hold as support moving forward, but a larger retracement could still find a floor at the 61.8% Fib. The 100 SMA is below the longer-term 200 SMA, though, so the path of least resistance is still to the downside. In other words, there’s still a good chance that the downtrend might resume from here. Then again, the gap between the moving averages has narrowed to reflect slower bearish pressure. RSI is on the move up to show that buyers are in control, but the oscillator is also in the overbought territory to reflect exhaustion. Turning back down could bring sellers in and lead to a drop in prices. Similarly stochastic is in the overbought zone to signal that buyers are taking a break, and the oscillator is already starting to head south so bitcoin might follow suit. Ripple got a strong boost earlier on in the week when a company exec pointed to the nearing launch of xRapid and how regulation has been a bit more friendly these days. To add to the positive vibes, it was just reported that one of the top US financial institutions, PNC, has joined a list of banks already using Ripple’s xCurrent platform. Many are hopeful that all these top institutions could later on be transitioned to xRapid, which uses actual XRP to bridge cross-border transactions. With that, demand for Ripple could continue to pick up as it enjoys more commercial adoption and higher volumes.